Healthy living comes with the territory. Where new trends and timeless traditions live together in harmony. Live in the heart of Holland where century-old trees line the streets and friends gather at the community flower garden. Landing in Rosa Parks Green, you’re within walking distance of our immensely popular Downtown and Hope College, full of art, theater and sports. Lots of ways to live. This neighborhood is attractive to everyone from single starters to recent retirees. 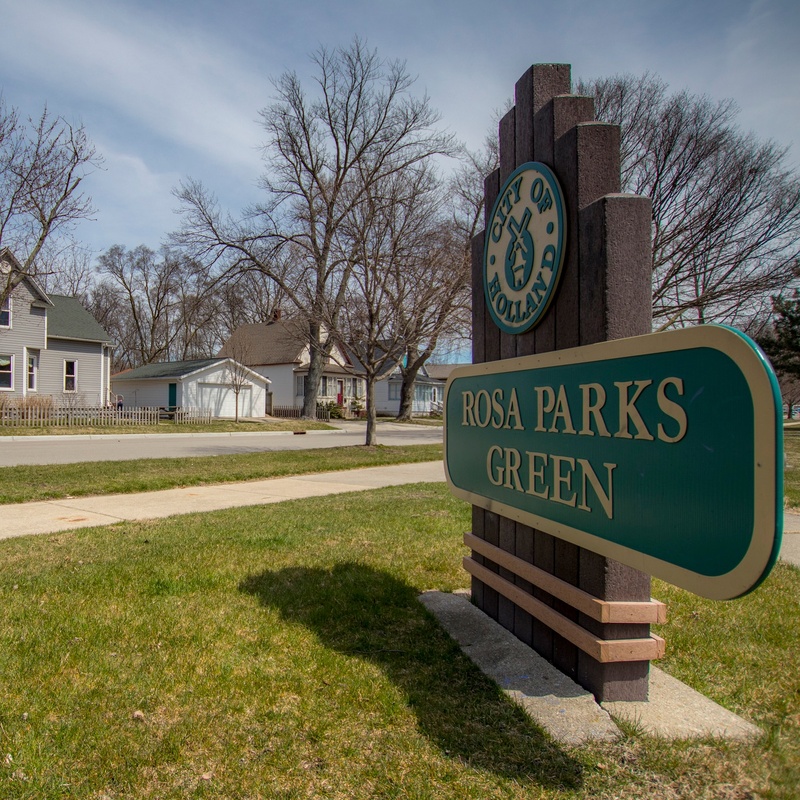 The quiet urban neighborhood of Rosa Parks Green is popular for those wanting single-family and two-family homes. Need more? Look a little closer, and you’ll find a small, quiet and well-maintained apartment complex here, too. Right in the middle of everything. At Rosa Parks Green, you’re only a ten to fifteen-minute walk (strolling speed) from one of the most adorable, hangout-able downtowns in America. You’re also only a short drive away from the movies, shopping centers and more restaurants than you can imagine. Housed in an old furniture factory, Baker Lofts is loft living large with a number of mixed residential condos and rentals. Amidst its exposed brick walls and massive wood beams, you’ll find a restaurant, deli, salon, spa, fitness center, an event center, and a variety of professional offices. Just a few blocks from Hope College, these urban living spaces are called home by students, professors and young professionals. The park at Rosa Parks Green. Right in the middle of the neighborhood, Rosa Parks Green is the perfect spot to sit and talk with friends and watch your kids play. When summer’s in session, Rosa Parks Green is home to Holland’s favorite summer playground program. Oh, and it’s free, too. On the edge of the neighborhood is a nice little-wooded area called Prospect Park. Holland bought it in 1907 for $1. Needless to say, it was well worth the buck. Today, Prospect Park is full of mature trees of every type. It’s a great place to relax while the kids have fun at the playground or enjoy a picnic with someone special. In Holland, the classic neighborhood convenience store has not gone by the wayside. Sure, a super mega grocery store is only five minutes away. But at Rosa Parks Green, an array of lovable neighborhood stores for everyday needs are only a short walk away. It boasts everything from loft living to single-family homes. The Wellness Trail and kids summer programs are free for all. Evergreen Commons, a hip place for the 55+ crowd to live it up. Whoever said neighborhood convenience stores are out of style, certainly haven't been to Rosa Parks Green.